or call our Sales Advisors for more details. The Ford EcoSport uses tried and tested Fiesta mechanicals to offer buyers a small SUV with added ride height and chunky good looks. Now it's got a more efficient 1.5-litre EcoBlue diesel engine, sleeker styling and a much classier interior with more sophisticated infotainment technology. In short, it's a far better product all-round. Ford didn't rush into bringing us a supermini-based Crossover model. Indeed, the market was awash with the things by the time the brand brought us its own take in this genre, the Fiesta-based EcoSport, in the Spring of 2014. Even so, there were signs that all was not quite right with the product planning. Early buyers questioned the car's refinement, its driving dynamics, its interior and the need to drive around with a huge great spare wheel hanging off the back of the tailgate. Fortunately though, Ford was listening. So, the brand has been continually moving to rejuvenate the car. In 2015, tweaks to the suspension improved the ride, plus buyers got the option to do without the rear-mounted spare wheel. In 2016, a pokier 140PS 1.0-litre EcoBoost petrol engine was added in at the top of the range. 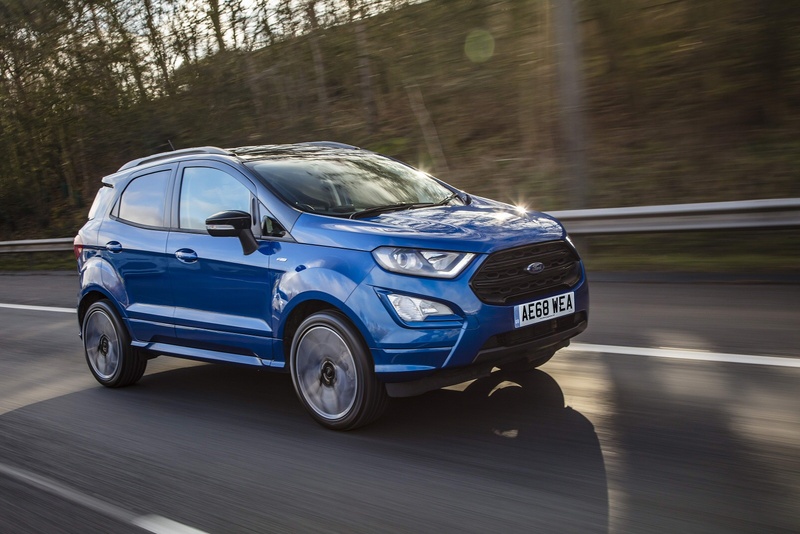 A year on from that, the EcoSport was more fundementally revised, with sleeker exterior looks, an all-new cabin and a fresh 1.5-litre EcoBlue diesel engine, all of this creating the rejuvenated model line-up we're going to look at here. As before, the chunky looks offer up a bit of Amazonian attitude, even if in truth, this car is more CBeebies than SAS in its take on hostile streetlife. Let's check it out. 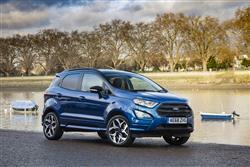 The EcoSport now gets a choice of five engines, three petrol units and two diesels. 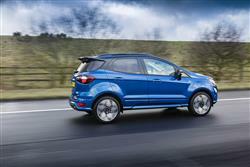 Petrol-wise, Ford's award-winning 1.0 EcoBoost three cylinder engine is available in 100, 125 and 140PS guises. The 125PS petrol variant can be ordered with the option of auto transmission. 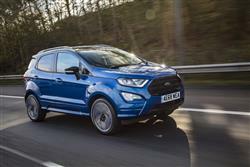 If you want a diesel, there's the choice of a 100PS 1.5 TDCi unit and front wheel drive or Ford's latest 1.5-litre 125PS EcoBlue powerplant mated either to front wheel drive or to the brand's 'Intelligent All Wheel Drive' system. Intelligent All Wheel Drive measures how the car's wheels are gripping the road surface and can adjust torque delivery up to 50/50 between the front and rear wheels in under 20 milliseconds - twenty times quicker than it takes to blink. The system seamlessly transitions torque between all four wheels and provides a more secure footing on the road especially in slippery conditions. 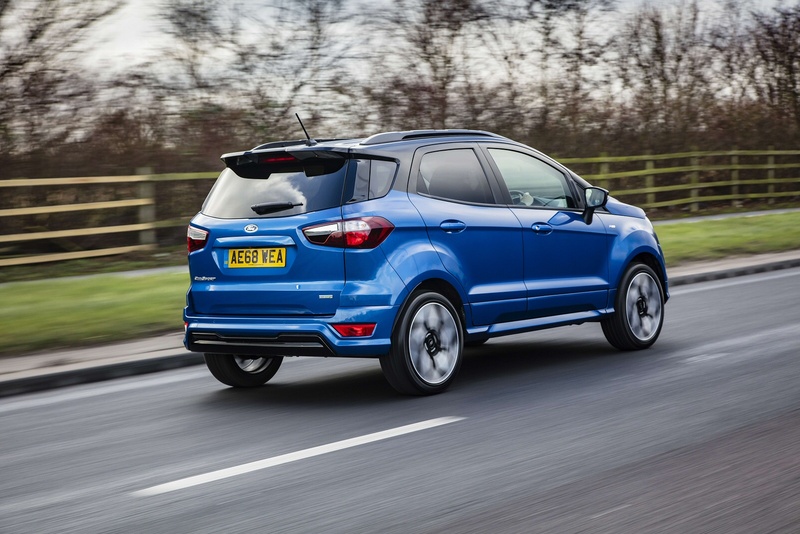 Ford says that this model has been developed to deliver ride and handling tuned specifically for customers in Europe, with optimised springs, dampers, spring aids, steering gear, Electronic Stability Programme settings and steering assistance profiles. 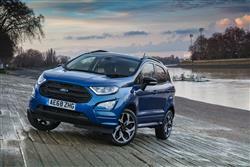 The EcoSport's styling has been brought more into line with the look of Ford's larger SUVs, the Kuga and the Edge. A more sculpted bonnet with a central bulge delivers a cleaner front-end appearance and the front-end design is now dominated by a smarter trapezoidal grille design and distinctive angular headlights that incorporate LED daytime running lights. Angular fog light housings complete a front three quarter profile that was apparently inspired by the straps of a rucksack and was designed to reflect an adventurous character. 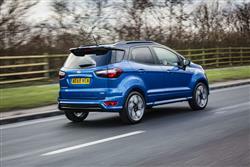 The EcoSport's rear bumper and tail light designs have also been revised to deliver a cleaner, more sculpted appearance. Customers can continue to choose a boot-mounted spare wheel option. 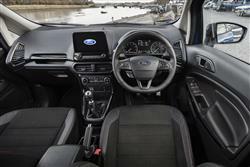 Inside, there are easier to use controls and soft-touch materials, plus a new centre console featuring fewer buttons. New seats designs improve long distance comfort and there's an optional adjustable interior lighting system that can be set to one of seven colours. Smart stowage solutions include a new height adjustable boot floor that can be raised to provide concealed storage, or lowered to increase luggage capacity to 334 litres. That new centre console features a built-in folding, sliding passenger armrest with a storage compartment ideal for tablet computers or snacks. 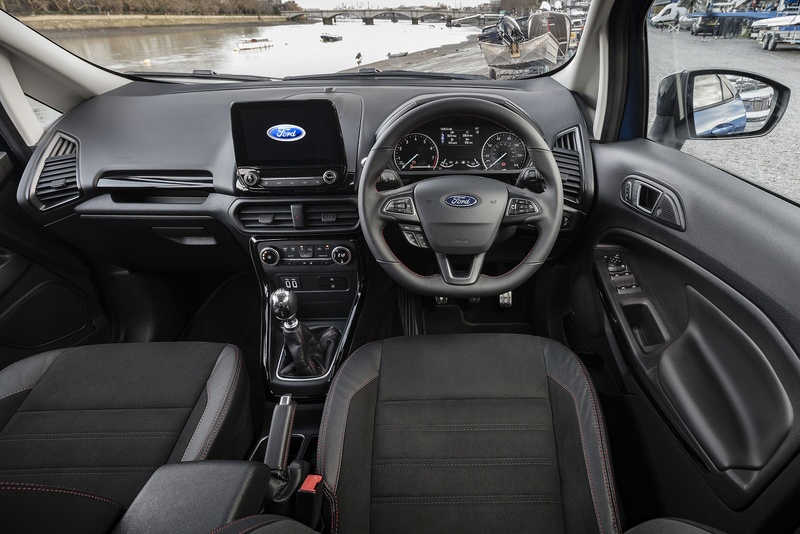 That side-hinged tailgate still accesses a load space that Ford reckons is big enough to swallow a 560-litre washing machine - once the 60/40 split rear seats are folded, that is. As before, most EcoSports wuill be sold priced in the £16,000 to £20,000 bracket. At the top of the range, there's a sporty 'ST-Line' variant. Equipment levels have been improved and now include Ford's sophisticated 'SYNC 3' communications and entertainment system, which is compatible with Apple CarPlay and Android Auto smartphone-mirroring systems. The 'SYNC 3' set-up is supported by a floating colour touchscreen, which can be operated with pinch and swipe gestures and is available in 6.5 and 8-inch sizes. Base models make do with a smaller less sophisticated 4.2-inch monitor. Go for the bigger displays and you'll be offered the option of a 'B&O PLAY' 10-speaker surround sound system. More optional technology now available includes cruise control with an adjustable speed limiter that helps drivers keep within speed limits. And a rear view camera that makes parking more efficient and safer. You can also have automatic headlights, rain-sensing wipers, a heated steering wheel, Electronic Automatic Temperature Control, an upgraded 4.2-inch digital instrument cluster and power-foldable mirrors. Safety technology includes an optional Blind Spot Information System that can alert the driver to vehicles approaching alongside. And standard Roll Stability Control that adjusts engine torque and braking to help drivers maintain control. Improved occupant protection now includes driver and passenger front airbags, a driver knee airbag, new side airbags and new curtain airbags. Plus the 'Ford SYNC with Emergency Assistance' system directly connects the vehicle occupants to local emergency services operators after an accident in the correct language for the region, using information from the vehicle's on-board GPS unit and mobile network to pinpoint the accident location. Economy and emissions aren't too far off the vehicle this car is based upon, the Fiesta. There's been some small controversy around the 1.0-litre EcoBoost engine not making anything like its claimed fuel economy figures in real world conditions, but that can be said of many small capacity turbocharged petrol engines. It's just a quirk of the NEDC fuel testing program. The 125PS variant claims to manage 52.3mpg on the combined cycle and 125g/km of CO2, while for the 140PS model, the figures are 52.3mpg and 125g/km. The new 125PS 1.5-litre EcoBlue diesel engine mated up to Intelligent All Wheel Drive delivers 52.3mpg on the combined cycle and 119g/km of CO2. 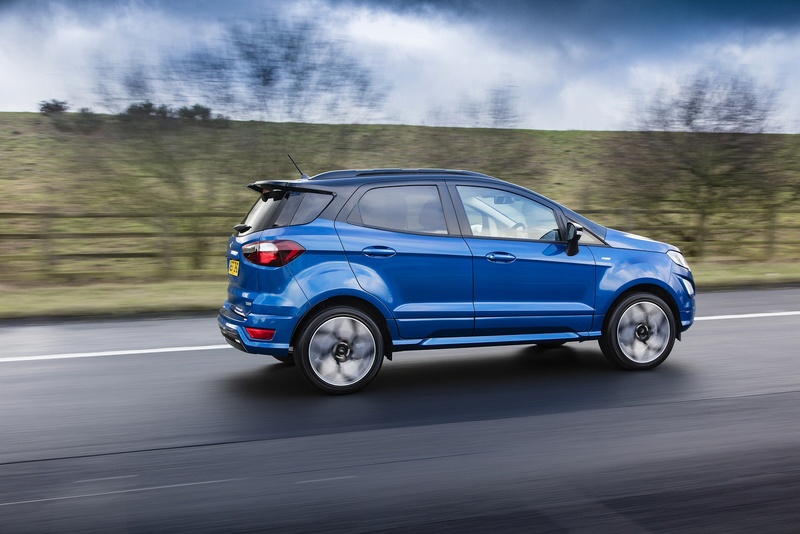 If you�re looking for a new Ford EcoSport 1.0 EcoBoost 125 Zetec Navigation 5dr Petrol Hatchback for sale, you�ve come to the right place. 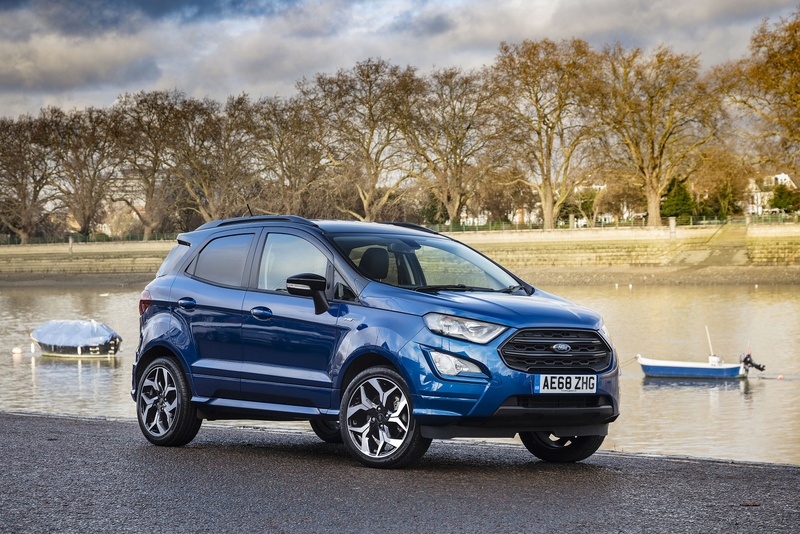 At Bristol Street Motors we don�t just have the best Ford EcoSport 1.0 EcoBoost 125 Zetec Navigation 5dr Petrol Hatchback deals, we also offer friendly advice and help with all your enquiries to ensure your buying experience is a happy experience. Terms & Conditions: Every effort has been made to ensure the accuracy of the information shown. However, errors do sometimes occur. The specification of each vehicle listed on the Macklin Motors website is provided by "CAP". Please note that the Images of each vehicle are range shots, these can include images which do not reflect the precise details of the vehicle you are looking at and are purely used for illustrative purposes. The inclusion of such data does not imply any endorsement of any of its content nor any representation as to its accuracy. We do not charge a fee for introduction to a finance provider; however we may or may not receive a commission.